The Instant Pot makes a hearty chili a breeze to cook. This beef and bean chili tastes as if it simmered for hours. 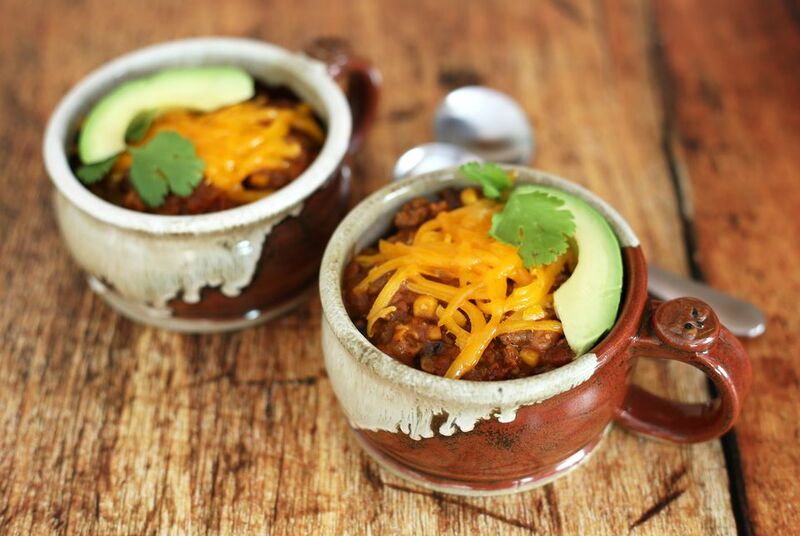 With an Instant Pot, you'll have a delicious, belly-warming bowl of red in less than an hour! A variety of canned beans, some corn, and bell peppers give the chili amazing texture, flavor, and color. The chili is versatile as well. The recipe calls for canned pinto beans and black beans, but feel free to use whatever kind you have in your pantry. Great northern beans, kidney beans, navy beans, and small red beans are all excellent choices. The total cooking time is about 30 minutes, but allow extra time—25 to 30 minutes—for the cooker to build pressure and for the natural release of pressure. Arrange the bacon in the Instant Pot and press the sauté button. Cook until the bacon has rendered its fat and is crisp. While the bacon is cooking, peel the onion and chop it finely. Remove the stem and seeds from the bell peppers and dice. Peel and mince the garlic cloves. Remove the bacon to paper towels to drain and leave about 1 1/2 tablespoons of drippings in the pot. Add the onions and peppers to the pot and cook for about 3 minutes, or until the vegetables are tender, stirring frequently. Add the garlic and cook for 1 minute longer. Add the ground beef to the pot and cook, constantly stirring, until it is no longer pink. Crumble the bacon and add it to the ground beef mixture along with the crushed tomatoes, black beans and pinto beans, tomato paste, green chilies, seasonings, and beef stock. Cover the Instant Pot and make sure the steam vent is set to "sealing." Using the manual setting, set the cooker for 15 minutes at high pressure. When the time is up, allow the pressure to release naturally for about 10 minutes. Remove the cover, add the corn, and press the sauté button. Continue to cook the chili, uncovered, for about 2 to 3 minutes. If the chili is soupier than you like, there are a few ways you might thicken it. Mashing some of the chili mixture can add thickness. Or, to keep with the Southwest flavors, add a tablespoon or two of masa harina or cornmeal to the chili and simmer it for 5 to 10 minutes longer. For extra heat, add about 1/4 to 1/2 teaspoon of crushed red pepper or add a minced jalapeno pepper. For a chunkier texture, replace the crushed tomatoes with diced or petite diced tomatoes. Fire-roasted or chili-seasoned tomatoes are excellent alternatives.